Let's take a look at a guide that will help you understand why versioning is needed and how you can version your REST API. This guide will help you understand why versioning is needed and how you can version your REST API. We will look at 4 ways of versioning and also compare the different approaches. Why do we need Versioning for RESTful Web Services? What are the versioning options that are available? How do you implement Versioning for RESTful Web Services? The following screenshot shows the structure of the project we will create. 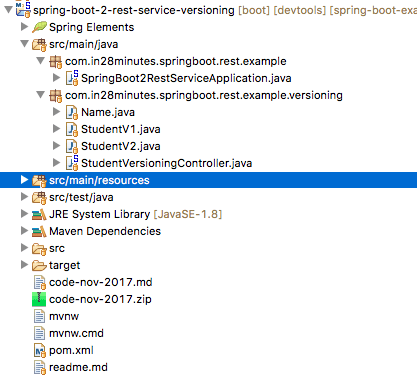 SpringBoot2RestServiceApplication.java — The Spring Boot Application class generated with Spring Initializer. This class acts as the launching point for application. pom.xml — Contains all the dependencies needed to build this project. We will use Spring Boot Starter AOP. StudentV1.java — Basic Version of the Student Bean. StudentV2.java — Advanced Version of the Student Bean using a seperate bean for Name. Name.java — Seperate bean for Name having different parts of the Name. StudentVersioningController.java — Controller from where all the service versions are exposed. Why Do We Need to Version Our RESTful API? The best approach to versioning is NOT to do it. Yeah, that’s right. Do not version as long as versioning is not needed. Build your services to backward compatible so that you can avoid versioning as much as possible! However, there are a number of situations where versioning is needed. At a later point, you wanted to split the name up. So, you created this version of the service. You can support both these requests from the same service, but it becomes complex as the requirements diversify for each of the versions. In these kinds of situations, versioning becomes mandatory. Let’s create a simple project and understand the 4 different approaches to versioning your RESTful services. Creating a REST service with Spring Initializr is a cake walk. We will use Spring Web MVC as our web framework. 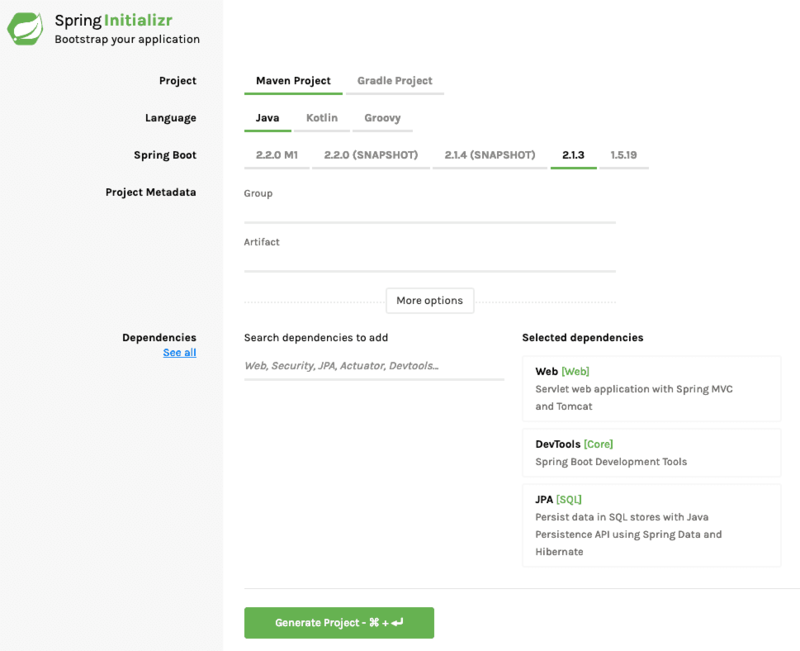 Spring Initializr http://start.spring.io/ is a great tool to bootstrap your Spring Boot projects. We would want to create two versions of services, one returning StudentV1 and the other returning StudentV2. Let’s look at the 4 Different Approaches for creating versions of the same service. A basic approach to versioning is to create a completely different URI for the new service. An example implementation is shown below. Next approach to versioning is to use the request parameter to differentiate versions. The third approach to versioning is to use a Request Header to differentiate the versions. The below picture shows how we can execute a Get Request Method with Request Headers using Postman. The last versioning approach is to use the Accept Header in the request. Below picture shows how we can execute a Get Request Method with Request Headers using Postman. URI Pollution — URL versions and Request Param versioning pollute the URI space. Misuse of HTTP Headers — Accept Header is not designed to be used for versioning. Caching — If you use Header based versioning, we cannot cache just based on the URL. You would need to take the specific header into consideration. Can we execute the request on the browser? — If you have non-technical consumers, then the URL based version would be easier to use as they can be executed directly on the browser. API Documentation — How do you get your documentation generation to understand that two different URLs are versions of the same service? The fact is that there is No Perfect Solution for versioning. The list below shows Major API providers using different versioning approaches. Plan to avoid versioning as far as possible but evaluate and be ready with a versioing strategy before you expose your first service to your consumer. Good Luck!